We’re still waist-deep in our series on Marketing and Selling MM romances. Make sure to catch all the previous posts, because I’ll keep referring to principles we discussed there. 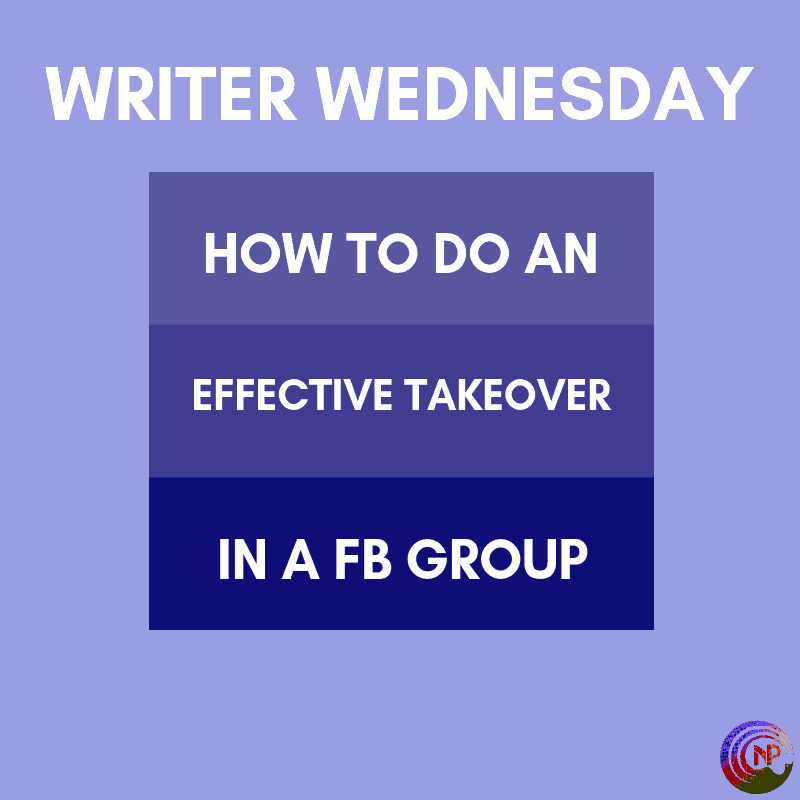 Today, we’ll be talking about how to do an effective takeover in a Facebook group. Let’s start with the basics. What is a takeover? It means that for an agreed period of time, you “take over” a group on Facebook, for instance a promo group or another author’s group. You post a series of posts during your allotted time, intended to promoted you and your books. Takeovers are well-known in the MM romance community, and readers tend to love them. That’s because they get to hang out with authors and interact, and usually because they can win stuff as well, like gift cards or free books. For authors, takeovers can be an excellent way to meet potential new readers. I’ve added many new members to my reader group through takeovers, for example, and I’ve seen tangible results in sales multiple times. They can be a crucial step in the Rule of Seven! Let’s start with talking about some ground rules for effective takeovers. The first is that you make a good impression. This is not only important for you, but also for your host. Show up on time, create a positive experience, thank your host, promote their book, etc. Small things, but they matter. If I can add more posts, I’ll always add giveaways or games and promo in equal measure so that balance stays intact. Your promotional posts can go a few ways. You can focus on a recent release and promote that one, or spread it out over your books. For me, it depends on the group I’m in and how much time I have. In an mpreg group, I barely even mention my contemporary books, for example. But no matter what you promote, remember relational marketing. Even when promoting, keep a conversational tone. Don’t just dump the blurb and a buy link. Trust me, you won’t get the same results as with a more personal approach. Also, shorter is better (and this is something I struggle with in takeovers). When promoting, try to keep it short and sweet. Long paragraphs and posts will wear readers out. Like I said, this is one area I really need to improve in. As for what to give away, I know not everyone can afford to share gift cards and that’s fine. They work, but so do ebooks of your own books and they don’t cost you anything. One last thing: choose your takeovers well. There are few things worse than wasting your time, energy, and money/prizes on a takeover that’s completely dead. before you accept, check in the group to see how previous takeovers went or who the other authors are that are coming. Group size also matters, obviously. But not all takeovers are created equal, so let’s talk about the secret ingredients of an effective takeover in a Facebook group. I’m gonna do this by sharing some do’s and don’s that I’ve learned. questions where readers can answer with a GIF are also popular, like where do you live, your fave TV series, etc. you can find games by googling or on Pinterest. Or create them yourself and be sure it’s somewhat unique. react to comments! This is a big thing, especially if you’re just starting out. Acknowledge readers by reacting to each comment and by commenting on a few at least. All it costs you is time, and it helps build relationships with readers. OK, that was a total brain dump with lots of practical tips, so I hope this was useful. Maybe you’re wondering how to score takeovers. This is where networking with other authors come in. The more author friends you have, the more active you are in building up friendships with other authors, the easier you’ll score great takeovers. Previous Previous post: Kissing the Teacher is Live! Next Next post: What Makes Readers Buy or Download a Book?